VietNamNet Bridge – A village that once suffered intense bombing during the American War is now a tourist destination. Cự Nẫm Village, located in Cu Nam Commune, Bo Trach District in the central province of Quang Binh, used to be known as a military station and one-night halt for Vietnamese soldiers heading southwards. Guiding us around Cu Nam Village himself, the chairman of Cu Nam Commune’s People’s Committee, Nguyen Thanh Hung, could not hide his pride to introduce his hometown. “More and more tourists have arrived at the village not only because it possesses picturesque scenery but is also a must-visit or legendary destination of patriotism,” he said. According to Hung, the village used to be the gateway to the north and south of the country, as well as being a communication station – the final halt of Vietnamese soldiers before entering battle. During the wars, it was called a “one-night” village as divisions of Vietnamese soldiers and the wounded would stay there for a night to rest before continuing southwards. Hung led us to meet Mai Xuan Gia – a war veteran who still had a sharp mind, even though he was 100 years old. His memories of that brutal time were clear as day. “On those days, the Vietnamese soldiers kept coming in and out of the village constantly. Cu Nam villagers used to work hard in the field in the daytime while at night; they carried and transported food, military equipment and weapons to help the soldiers. Everyone was willing to make room for the soldiers to rest overnight. “I remember one or two groups of soldiers arriving at the village every day and all the villagers helped them until one or two in the morning,” Gia recalled. Most local elderly can recall memories of a difficult but prideful period, like Le Thi Ngan who cut down trees to hide artillery, Phan Thi Luyen who washed clothes for a platoon or Nguyen Thi Xe, who cooked for a whole company and tended to the wounded. Cu Nam Village today is no longer a one-night village like it used to be, but is an attractive destination to not only domestic but also international tourists. 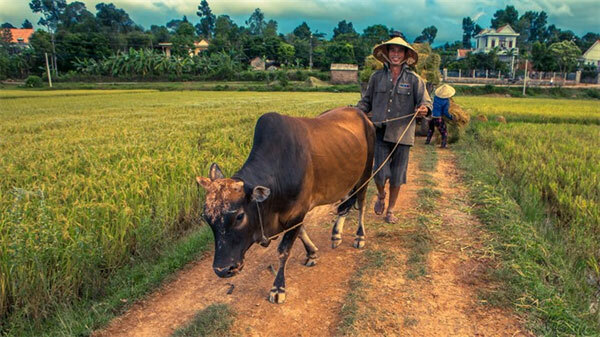 A visit to the village allows them to explore the lifestyle of Vietnam’s rural area and enjoy its pure air and picturesque landscape. If they wish to, the tourists can also join local activities like farm work. According to Hung, dozens of households in Cu Nam Village and its vicinity have invested in building hotels, restaurants and homestays. One popular and pioneering local accommodation is Phong Nha Farmstay, opened by couple Benjamin Joseph Mitchell – an Australian construction engineer – and Le Thi Bich, a local. After visiting his wife’s hometown several times and being enchanted by its scenery, Mitchell decided to quit his job to set up a tourism business with his wife. Phong Nha Farmstay was then established in 2008. 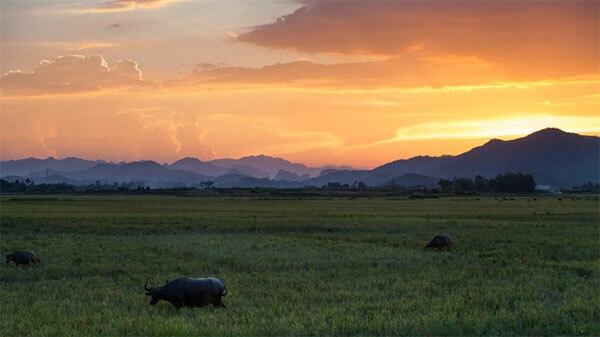 Despite being located in an isolated village not near beaches or UNESCO World Heritage Site Phong Nha-Ke Bang (despite its name), her farmstay is surrounded by immense paddy fields and a peaceful rural atmosphere. Every morning at 7am Mitchell or one of the staff take guests that want to go on a walk around the village and the rice paddies and tell them about the village and farming. 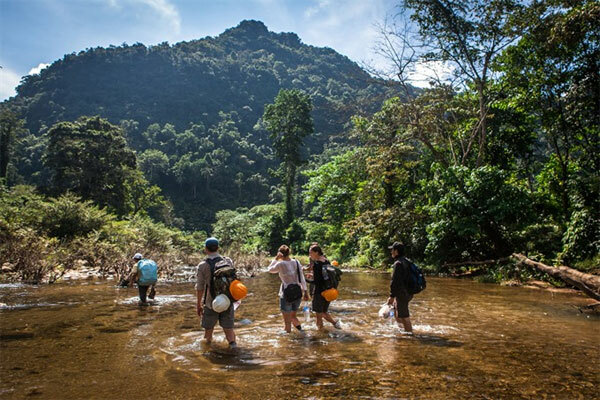 They can also try their hand at farm work or join excursions to Phong Nha-Ke Bang National Park to explore the world’s largest cave, Son Doong. 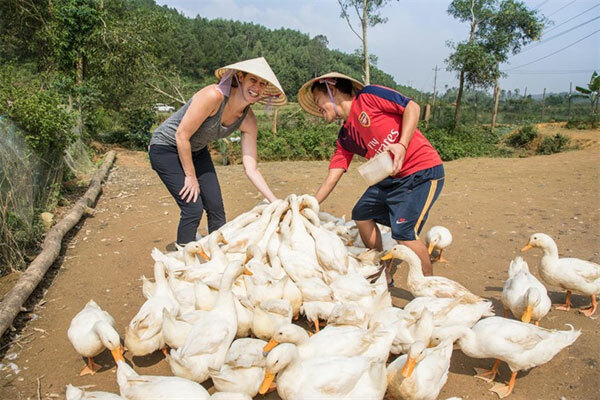 According to Mitchell, various things entice the tourists to come back to Phong Nha Farmstay, one of which is the service quality. “Happy staff enjoy what they do. Information is gold. Foreign guests appreciate understanding what is happening around them. Communication is very important, and so is comfort and cleanliness. “Good food and a wide selection of food and beverages help too, in addition to activities. It is okay to have expensive tours to caves on offer but you also need to have many suggestions of things to do that are fun but inexpensive. We have worked hard to build this up in the area,” Mitchell said. Mitchell and Bich have also assisted many other local households to run their own tourism business and gained success, like Tran Van Quy and Nguyen Thi Nhat, whose lives used to depend on illegal logging. In 2010, Quy and his wife quit their illegal trade to offer tourism services in their house. They run a “farm to table” restaurant named The Pub with Cold Beer, serving primarily local food like BBQ chicken, roast peanuts or fresh vegetables with cold beer. This simple food has attracted more and more tourists from around the world to their house. “To tourists, particularly international ones, the service attitude is the most important. We the hosts always serve our guests with happiness and friendliness. The prices are also reasonable. When they come back home, their positive feelings towards their experiences will be shared on social networks like Facebook, which has helped to introduce more guests to our house,” Nhat says. According to Ho An Phong, the director of Quang Binh Province’s Department of Tourism, Cu Nam Village possesses not only beautiful natural landscapes but also unique culture and traditions, and friendly, hospitable and sociable locals. “All of these elements have created the community-based tourism trademark of Cu Nam Village and attracted an increasing number of tourists there,” he said.